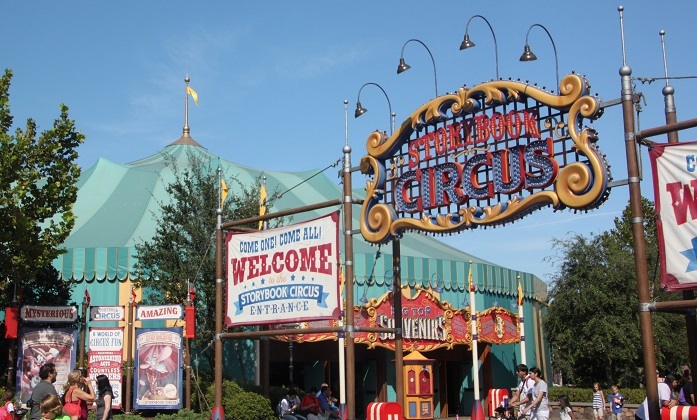 Fantasyland is probably the area that first comes to mind for most people when you mention Magic Kingdom. Based on Disney’s classic animated films with a bit of a fairy tale theme, I remember being wowed by it all on my first Disney visit, oddly not the effect I experienced this time. We did enjoy this land but not as much as the other areas of the park. 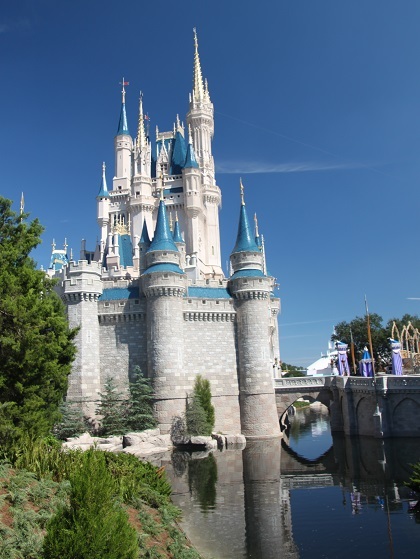 All fairy tales must have a castle – this one has Cinderella’s Castle as the gateway into Fantasyland. Tall, great spires and not unlike Schloss Neuschwanstein in Germany, the difference is this one is made from plaster, concrete and fibre glass. 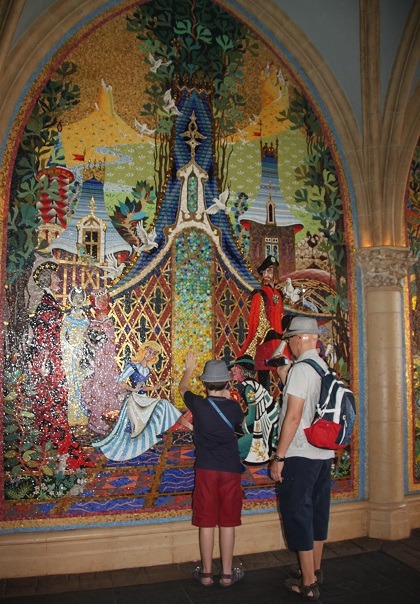 We checked out the mosaic murals on the walls inside which tell the story of Cinderella. Interesting fact about the castle – apparently when you walk down Main Street to the castle the bricks get smaller the higher up you look. This “forced perspective” effect means the castle looks taller than it would if all bricks were the same size. Like the whole area, the rides are fairy tale themed too. Son was willing to do most of them but it was a bit of a hit and miss experience for us – his coolness was seriously tested here especially riding Under the Sea and reliving moments from the Little Mermaid. Enchanted Tales with Belle was an interactive show we saw one morning when we had some spare time. It was quite good, billed as suitable for all ages but it was definitely not Son’s thing. Probably more for those with cute, young children as they interact with Belle and act (in the loosest sense of the word) her story in the castle. I did enjoy it, especially the mirror in Maurice’s workshop which transformed into a portal that we had to walk through to get to the castle. That was pure Disney magic. Son humoured me (the bribe of an ice-cream worked) and posed with Belle after everyone else had left. 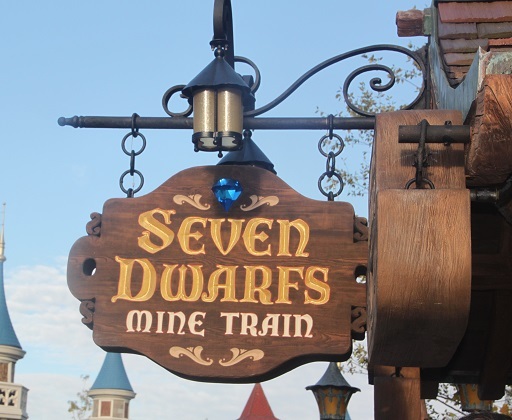 The Seven Dwarfs Mine Train was a new ride, much touted in the press and hence long queues. We tried and failed miserably to get a Fast Pass. A cast member told us they are snapped up within seconds so you would be unlikely to succeed with this approach. Queue times for this ride sometimes exceeded 3 hours during our visit, someone told us the best way to ride is get to the park gates as they open, make your way straight to the Mine Train where there will still be a line, just not one where you stand for hours. We followed these instructions to the letter and still queued for 40 minutes. The line moved fast, was actually fine and they had lots of interactive things to do while you waited. We were all looking forward to this ride – the updated story of Snow White using animated figures, rocking roller coaster cars and the much publicised diamond mine and animatronic dwarves. It was fun, just far too short and finished way too soon. We left feeling more than a bit disappointed but incredibly relieved that we didn’t have to endure a 2 hour wait – that would have tipped me over the edge. 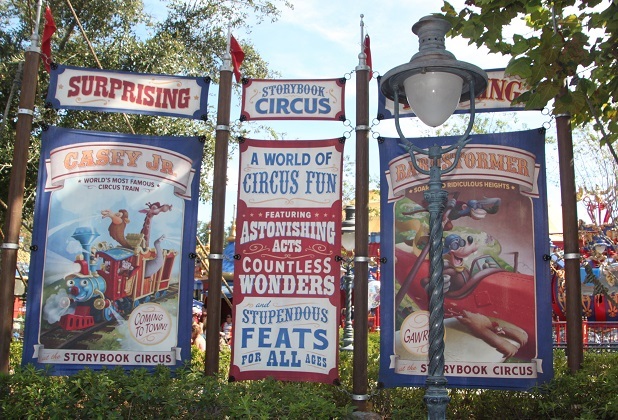 A stroll around Storybook Circus and we found bright colours, circus posters and lively music. It looks great and the Dumbo ride at night time is definitely worth doing. With Fast Passes we did all of the tamer rides here too – no queuing so nothing to lose. 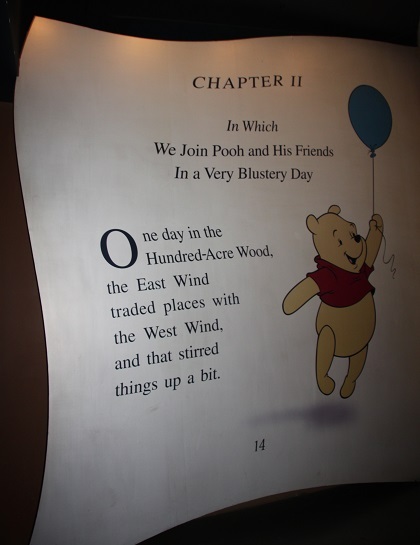 Winnie the Pooh took us into the storybook world of Tigger, Piglet et al where enormous pages from the charming stories come to life. We travelled through the Hundred Acre Wood in our “hunney pot” and bounced around with Tigger – all enhanced with special effects, fibre optics and cute music. Son really loved Mickey’s PhilharMagic – I remember being utterly blown away by this on my first Magic Kingdom visit. I think now we are spoiled with 3D cinema experiences so the novelty value is lost a little. That said it was excellent, we loved seeing the classic Disney scenes on the massive screen – the world’s largest seamless movie screen – and became totally immersed. 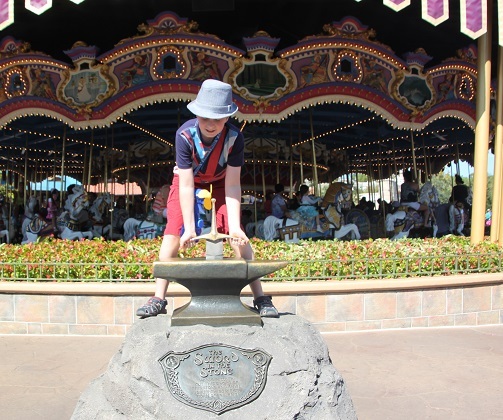 We rode the Cinderella themed carousel, Son tried and failed to extract the sword from the stone and we had a slow paced boat ride through colourful scenes depicting the regions and cultures of the world in It’s A Small World – the theme song ran through my head for hours afterwards. After a spin in a giant tea cup at the Mad Hatter’s Tea Party and a flight over London in a pirate ship with Peter Pan we had covered most of the fairy tales. We used our Fast Pass for Peter Pan and climbed straight on board. What a great way to finish the day – not swish, a bit old fashioned but I loved being suspended in the air looking down over the Darling nursery, London, the mermaids and riding through the battle between Captain Hook and Peter Pan. The ride is low tech, no fancy animatronics and most of the effects are achieved by glow in the dark paint. No matter, Peter Pan gets me every time, I think it’s magical and what Disney is all about. I didn’t realise that about the castle. So interesting. I thought it was so intriguing too – they think of everything! Everything looks so cute; very nice! It is – so pretty. Very cute 🙂 great pictures! That’s a neat trick with the bricks! It intrigued me too – the sort of geeky fact I like!! It sounds like fun, so interesting to hear about the bricks and I just love the topiary trees of Mickey and co. A lovely read on a cold, damp morning! Absolutely, we only stood in line for 40 minutes which was fine!! We did really enjoy the ride but when it stopped just all looked at each other thinking is that it!! Oh wow they did a very good job with the bushes on the first pictures ! It must have taken a long time ! The horse is also really pretty. 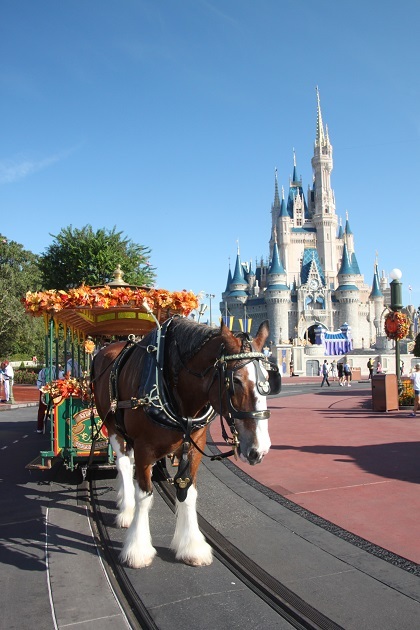 I love the old horse drawn trolley – so quaint and cute. The bushes are incredible too – takes some gardening skill (which I severely lack) to be able to do that! 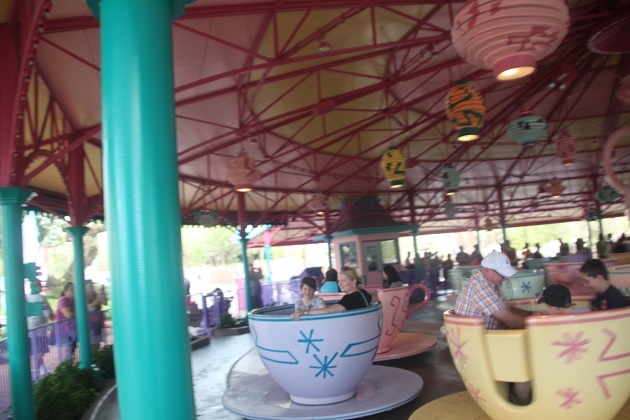 I must confess Joy that the Peter Pan ride was one of my favourites when we visited Euro Disney – I could cope with that one riding through the magical world of mermaids and pirates plus I enjoyed the Mad Hatters Tea Party too! All great fun and didn’t make me feel sick like some of the other rides. Very interesting to read about the illusion created with the different sizes of bricks and the castle perspective. I did love the castle at Euro Disney and very happy to have visited the real Neuschwanstein too last year!! It’s a cute castle in Disney but not a patch on the real thing Rosemary, that’s for sure!! I definitely realise now that thrills and spills are not for me, the gentle and sedate rides are right up my street!! Am glad I’m not the only one who makes for the gentler rides Joy! I just don’t enjoy the others though the rest of the family does (or did when we last went to Euro Disneyland)! Clearly I don’t do enough creative clipping with my hedge! 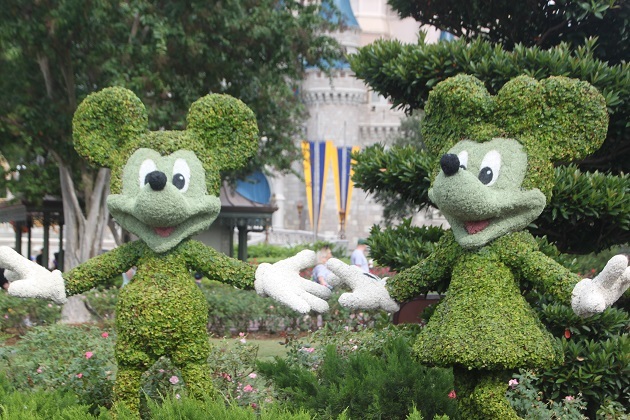 Feeling inspire to create a Mickey Mouse this morning…not sure where to begin though. Lol! I struggle with the basics – just clipping and cutting!! Good luck with the Mickey theme…. Peter Pan is my favorite ride in Fantasy Land. I didn’t realize the castle was Cinderella’s in DisneyWorld. I thought it was Sleeping Beauties like it is in DisneyLand. How neat it isn’t totally the same! The Peter Pan ride I just think is so gorgeous and utterly wonderful. I didn’t realise that in DisneyLand it was Sleeping Beauty’s castle – that is a great touch! Enjoy. Last we went to Disney(world) with the girls was close to 20 years ago. ‘Will have to wait for grandchildren to come and grow a bit for the next ride. 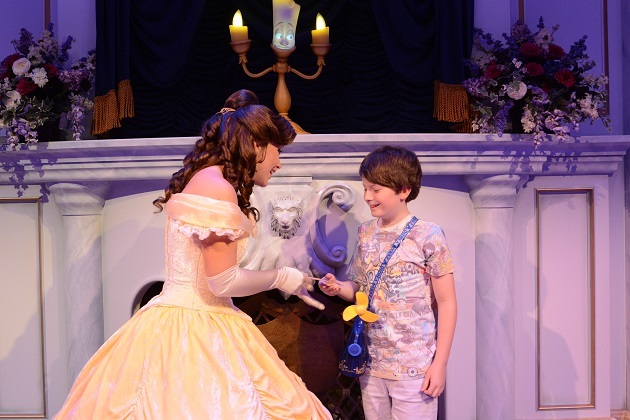 Love that you got your son to pose with Belle! What a sweetie:). Well, a bit of negotiation and a bit of bribery and we got there in the end!! Absolutely, such unbelievably amazing attention to every little detail! Thank you very much – I like the Mickey and Minnie one too! !